A series of Cask Ale Trails in Nottingham city centre have been developed by Nottingham Business Improvement District (BID) for a month long campaign starting on 19 April, designed to highlight the great range of cask ales available at 41 pubs and bars in Nottingham city centre. 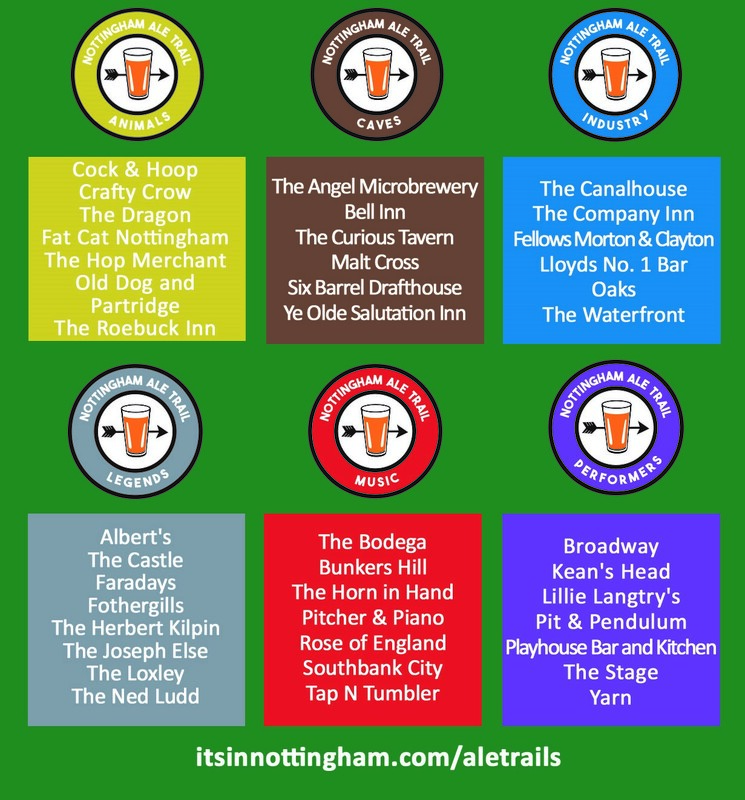 There will be six themed It’s in Nottingham Cask Ale Trails for people to follow. These are featured in maps and cards produced by Nottingham BID, that are free for people to pick up at any of the participating venues or from Nottingham Tourism Centre. People are being encouraged to visit each one on a trail, buy a cask ale and collect a sticker to put on their map or card, with a different sticker available at each stop. They can then take their completed map or card to Nottingham Tourism Centre to claim a free limited edition enamel pin badge. Anyone completing all six trails is also eligible for a free t-shirt that have been specially produced, that they can also collect from Nottingham Tourism Centre. There is also a Cave Trail featuring pubs with caves. The pubs taking part in this one are The Angel Microbrewery, Bell Inn, The Curious Tavern, Malt Cross, Six Barrel Drafthouse and Ye Olde Salutation Inn. The Industry Trail includes pubs which have links with various types of commerce and industry. These are The Canalhouse, The Company Inn, Fellows Morton & Clayton; Lloyds No1 Bar; Oaks and The Waterfront. The Legends Trail features pubs associated with some of Nottingham’s well known legends: Albert’s, The Castle, Faradays, Fothergills, The Herbert Kilpin, The Joseph Else, The Loxley and The Ned Ludd. The Music Themed Trail includes pubs that are synonymous with good music – The Bodega, Bunkers Hill, The Horn in Hand, Pitcher & Piano, Rose of England, Southbank City and Tap ‘n’ Tumbler. And last, but not least, in the series of Cask Ale Trails is the Performers Trail with all the venues featured in this one linked to stage or screen. These are Broadway, Kean’s Head, Lillie Langtry’s, Pit & Pendulum, Playhouse Bar and Kitchen and The Stage and Yarn. 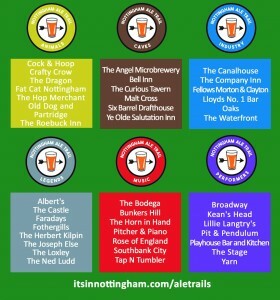 Visit www.itsinnottingham.com/aletrail for more information on the trails.